The other day, I sat in front my computer hemming and hawing for what felt like 45 minutes. Should I go on Facebook Live and share the current thoughts of my heart? My heart was racing and I was starting to sweat. It wasn't my first time showing up on social media in this way, as I have done 3 or 4 live videos before, however something kept me staring at my screen in anticipation that evening. It's not easy showing unexplored vulnerable sides of myself! For some reason, it takes a lot of butterflies for me to show up in "real time" online, even though I make and edit videos all the time. I think that the main reason why it feels so difficult, is the fear of the unknown energy that can occur. What if I lose my train of thought? Or start the video with my energy going strong, lose that energy and then not have the comfort of re-starting or doing "another take." What if I start crying, because I feel so passionate (alive/emotional) about what I am talking about? These are the thoughts that were holding me back from hitting that "live" button that evening, though I know in my heart that I want to grow in this area, and show up as a leader. I think that because I am so passionate about making videos and spend a lot of time doing them, I want to make sure that I am sharing valuable content all the time, that meets my artistic approval. 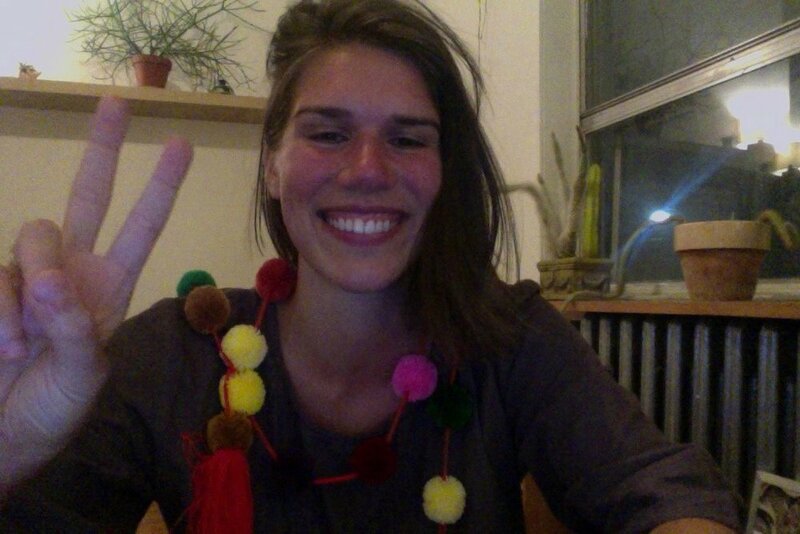 That night I decided to grab a strand of pompoms that I brought back from Mexico, to wear around my neck. This would help serve to remind myself that this social media stuff is all a big cosmic joke anyway – a minor blip in time. It is funny how much time we spend building up/procrastinating something that feels important to us, when the act of doing the task ends up feeling simple and easy. Kind of like that high school essay that you worry about and procrastinate for an entire month, then bust it out an hour before it's due, without even breaking a finger nail. What I believe will help me align in meeting, matching and conquering my greatest fears, is to visualize and identify what the worst case scenario is. (I feel like Tim Ferris talks about this idea). Are we afraid to show up as being vulnerable humans that don't have it all "figured out"? It is ironic because humans love seeing other humans showing up to conquering their fears in vulnerability - that's the content that we like seeing! That's the magic ingredient! It's even funny that showing up to the possibility of crying in front of people, (which can be considered the worst case scenario for some) might actually be considered the best, in the eyes of others. Removing some of the masks that we wear and showing up from a place of softness and authenticity, is one of the most refreshing energies to be surrounded with. I LOVE being in the presence of passion and vulnerability. It's an honour. This is an important lesson for me and for so many. May we continue show up for each other in all our real and raw states. This is the juice that will allow us to grow individually and collectively on this planet. Thanks for being you! Posted on February 5, 2018 by Jill Richards.